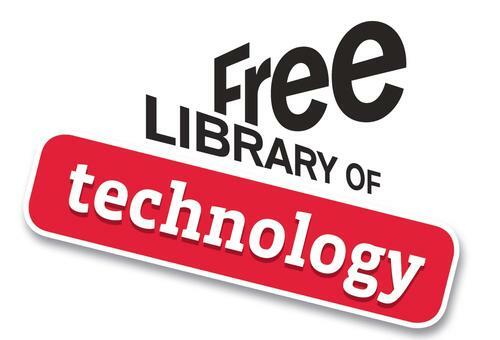 The Free Library has been hard at work upgrading our website to make it more user-friendly, encourage exploration, and offer better customer service. Our most recent updates include a revamped design and added features and functionality to the Calendar, Databases, Blog, and Explore sections of our website. We’ve built a streamlined and responsive layout (you can view and use on any device or modern browser, in desktop and mobile environments), as well as refined search capabilities and discovery throughout these updated sections. The ability to filter events (i.e. 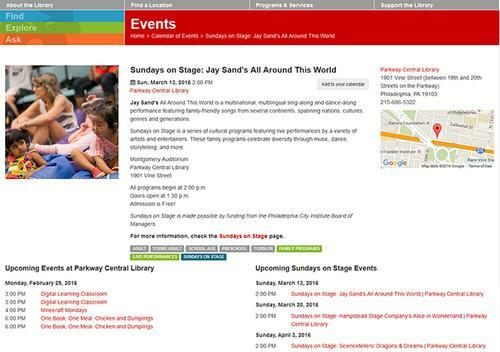 view all Live Performances at Parkway Central for School Age children)! The use of “tags” to view additional similar events, refine or enlarge an event search, or discover something entirely new. Tags are color coded for ease of use: Green for Event Type, Blue for Event Series, Red for Library Location, Grey for Age Group, and Orange for Date. The event detail page now includes larger images, as well as Google map integration to easily find the location or acquire directions to where the event is being held. 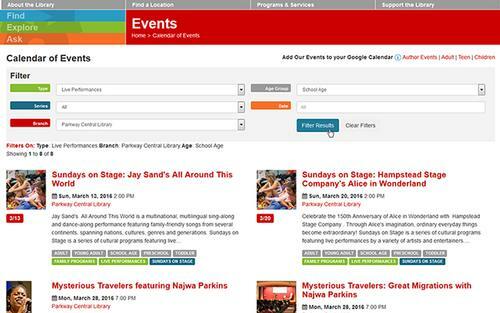 Additional suggestions for upcoming events, filtered by library location and event series or type. 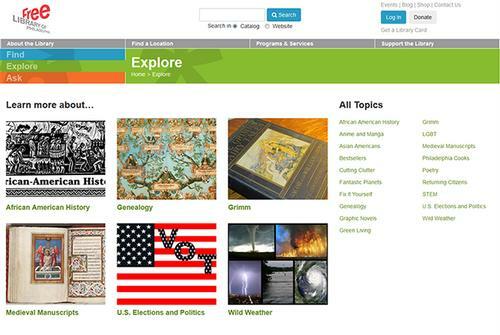 New layout for our Databases page, where you can access our Digital Media and Digital Learning portals. 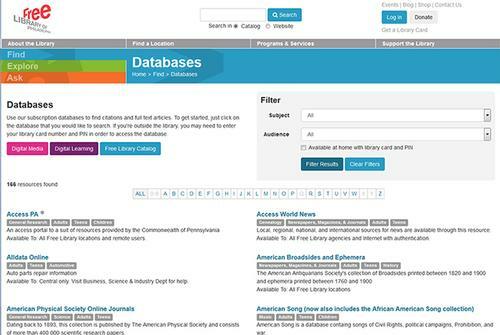 You can filter database results by Subject and / or Audience, as well as alphabetically. 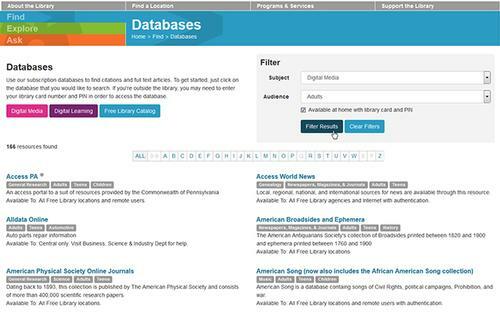 Again, with the use of tags you can view additional similar database resources or refine or broaden your search. New streamlined look to our Blog including a simpler color palette, tags cloud, and corresponding display of the amount of blog posts per topic tag. We've also improved the search capability across entire Blog. 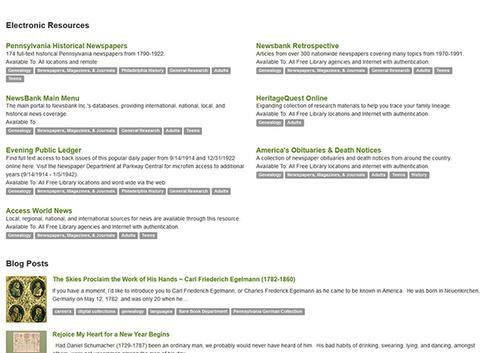 The Explore section is now much more robust and is able to pull in resources from our Catalog, Databases, and Blog, which will allow us to create Research and Learning Guides with all of the resources available to us including booklists, digital resources, podcasts, weblinks, and more. 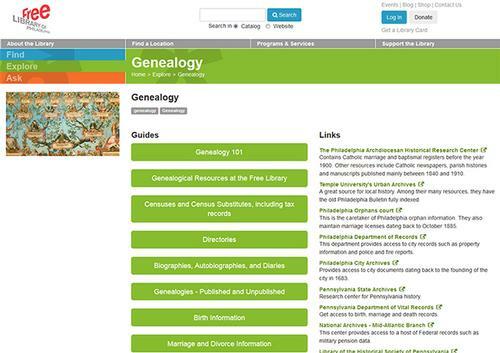 One of our more popular Explore topics has been Genealogy, which is a great example using the Research Guide format. 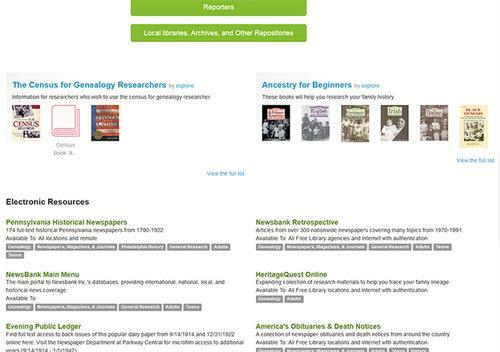 There are links and sections for Catalog Items containing booklists, Electronic Resources from our many database subscriptions services, Websites with links to Genealogy information around the Web, and the research guides themselves within the Genealogy 101 and Advanced Guides links. Please give these updated sections a try and let us know what you think. we always apprecoiate your feedback! 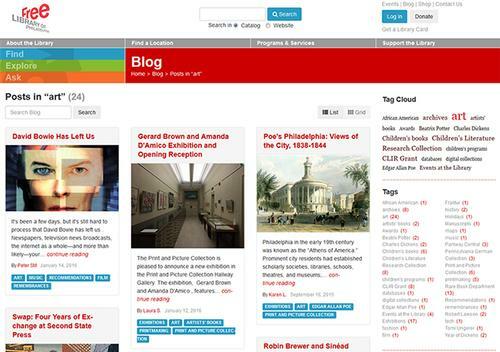 Add a Comment to Website Updates: Calendar, Databases, Blog, and Explore!